Since we’re talking about wheat, why don’t we start in the kitchen? Now, I’m not the most faithful of recipe followers. I can barely cook. I never measure vanilla extract; I detest mixer etiquette: like the speed really matters, and I don’t sift flour. In fact, I’m convinced that a sifter was invented by kitchen accessory companies as a way to squeeze more money out of wannabe chefs which, thankfully, I am not. 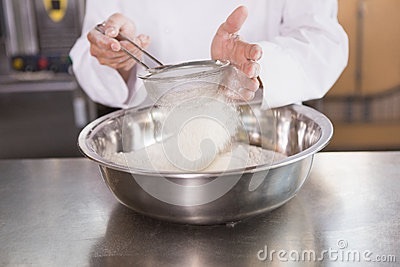 However, a real chef, which clearly I am not, will tell you the importance of sifting. They will go into a long spiel about why it makes the dish better. I’ve read it in many of the recipes that I’ve browsed while in moments of utter boredom. They’re right, I’m sure, but that doesn’t mean I’m willing to go through with the process. I’d rather live my fantasy about why sifting flour isn’t important because it makes the dessert easier, and it’s only good for coating chicken. In fact, that’s exactly the same reaction I have with my life being sifted. I much prefer the easy, softer method of getting to where God wants me to be. My desire is that He take me from messed up to fixed up in the rough areas of my life without having to go through the tough work of restoration. Throw in the fix, and I’m good to go. But it doesn’t work that way, and there’s a good reason why: being sifted leaves a mark that instant fixes don’t. We need the scars to remind us …. Notice how Jesus explains this to Peter. First, He tells Peter that Satan has “asked” to sift the disciple. “Asked” as in requesting permission from God to test Peter. Second, Satan gets permission just like he did in the case of Job whom he attempted to break and push to turn on God (Job, chapters 1 & 2). 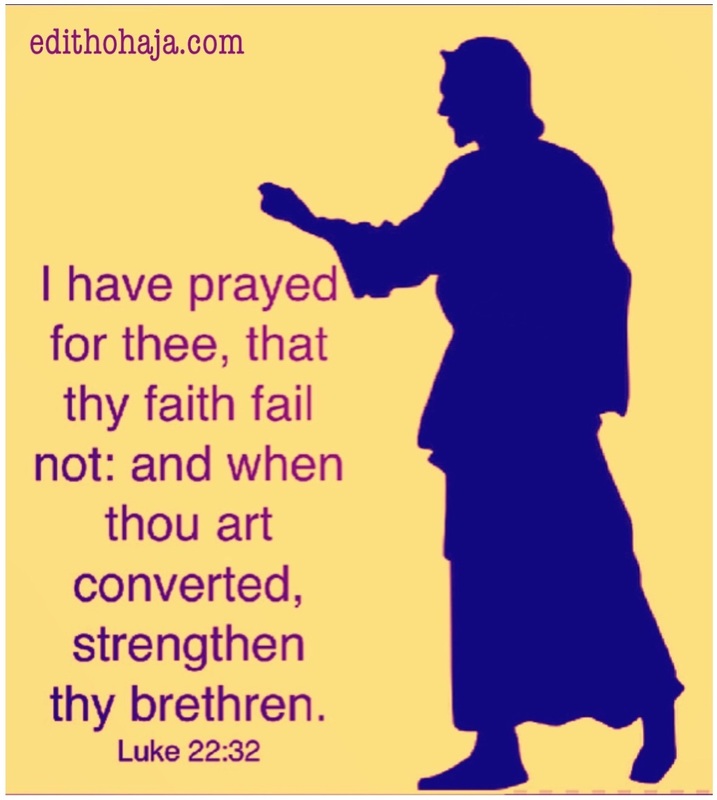 Jesus, however, assures Peter that He prayed for his faith not to fail. In other words, Jesus promises to hold the disciple together, but He doesn’t stop the testing. Finally, it’s only after the sifting and restoration that Peter can strengthen his brothers and sisters. That’s the key here. Peter gets sifted (through his denial of Jesus), but because he’s sifted, he can restore his brethren. His faith gets a huge boost, and the post-sifting Peter becomes a rock-steady man of God. Yes, sifting stinks, and we’d all prefer that God would just snap His mighty fingers and make us the man or woman He wants us to be. But if He did, we would miss the blessing that comes from being refined in the fire. Yes, I said “blessing,” a big, fat blessing ~ even if it doesn’t feel that way at the time. Friends, many believers are boldly declaring that “there is a shift” in the Kingdom of God that will release God’s power and glory like never before upon His faithful servants for the advancement of Kingdom work. However, scripture clearly lets us know that there is a SIFTING before there is a SHIFTING. Many of us are in the season of the sifting and not the shifting. If we are wise we will take note of the powerful truths revealed in the lives of the disciples. When the sift hit, they denied Him, sold Him out, committed suicide, and were even willing to commit homicide (Peter with the sword), not totally understanding the prophetically declared purpose of our Christ. Sure, they walked with Him, did miracles, and even taught His words, but in the Word of Christ throughout scripture it is evident that there was not a full understanding nor conversion. They held fast to the expectation that Jesus would be an earthly king who would establish an earthly Kingdom which would bring restoration to Israel, which is why they each “lost it” in the season of sifting! This is also validated in Mark’s account of the miracle of the fish and loaves which goes right into the storm that He sends them into in Mark 6 and by verse 52, He is saying that even after the fish and loaves, and His miraculous walk on the water to calm the seas and rescue them, that “they still didn’t understand the miracles because their hearts were hardened” meaning callous and unyielding. In the scripture reference for this message (Luke 22:31-32), it is clear that although they had walked in intimacy with Christ, learned of the Father through Him and seen the evidence and weight of the power of His name in their ministration, they still weren’t converted. Jesus knew when He completed His assignment there would definitely be a shift, but they wouldn’t be ready until the sift, which would aid in bringing them back to Him and converting them. Sifting of the wheat is the process of removing the outer hard cover. It is separating the good profitable part of the seed from the bad unprofitable part. To get the picture of what it requires, let’s examine how wheat is sifted manually in agrarian societies. 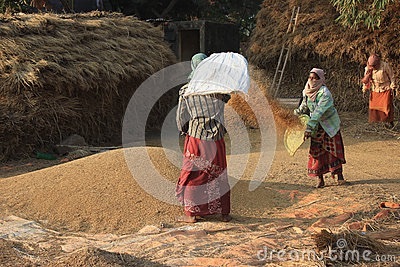 The first step called threshing removes the edible seeds/grain from the chaff. The wheat is spread on a hard floor and beat thoroughly with a tough stick known as a flail. This is followed by winnowing to remove the chaff from the grains. This stage involves tossing the wheat in the air to allow the chaff to blow away in the wind and the grain to fall back down. One can see that the wheat undergoes some necessary pounding, throwing up and falling down for the real grain to emerge. Similarly, the sift (as scary as it is) is what reveals who you are and it aids in the removal of every unnecessary and wicked part of your heart, flesh, and soul that would block you from being fit and profitable for the Master’s use! The sift reveals your true fears, motives, desires, agendas, and it is often not a pretty sight! Honestly, Peter didn’t realize that he was capable of denying Christ until the Lord showed his true self. Imagine if Peter had never gone through that. He wouldn’t have fully understood himself and his own frailties or true role in the coming shift. Jesus allowed this in Peter’s life even though he loved him, just as He allows it everyday in our lives because He loves us and knows it is necessary to reveal and expose the true us, and in light of the Word of God and the illuminating power of the Holy Spirit who leads us into all truth, prayerfully we will make adjustments and let the purging take place. We are in a time of sifting and separating now, and unfortunately many sad things are being exposed and revealed in the body of Christ. We are seeing world mergers between pastors and the people of the world to supposedly “accomplish” the mission of the gospel. We are seeing prophetic partnerships where so-called “prophets” release tainted messages in places of partnership and pre-established financial contracts for services. We are seeing men and women release perverted and twisted words and revelations to appease their flesh. We are seeing those once deemed as “God’s generals” boast in riches and fame. What is so sad is that in a time of the worship of self, man, and mammon, we are seeing people who know no Word, are not filled with the Holy Ghost, who fight to defend their cause which is not of Christ and honestly is heresy in the highest form. Because we are people pleasers and easily led astray, we defend them, or feel we are judging others if we don’t agree or even bring correction to their behaviors. The encouraging part is this: Knowing that the sift makes Jesus shine through us, and can qualify us to be used mightily in the advancement of the gospel message, if we allow it to have its perfect work in us. Note that Jesus knew that Peter was eventually going to grow intensely stronger by having gone through this sifting. This brought tears to my eyes as I read that passage. He says, “when” you have returned to me, not “if”. Jesus saw what Peter would become after the sifting and so it is with you and I! Glory to God! Today, see the sift for what it is and let that prepare you for the shift of the advancement! Will you be “converted”? Will you allow God to remake you for His true purposes? Remember, Jesus is sitting at the right hand of the Father, making intercession that when we are truly converted and sold out to His Word, fully empowered and led by His Spirit, no longer a slave to sin and self, we will strengthen many! What a glorious promise! So many need strength! Let’s be sifted, so we can get shifted and we can all be lifted!!! Amen! Give me I pray, my Lord, a deeper understanding of the hope of my calling and the part that You would have me play. I pray that I may be covered daily with the spiritual armour of God, which You have provided for all Your children, knowing that we wrestle not against flesh and blood, but against spiritual rulers and forces of evil. Help me to gird up my mind with the gospel of truth as I walk in the way of peace. Equip me I pray with the sword of the spirit, which is the Word of God, so that I may be able to protect myself against the deceptive teachings and doctrines of demons that lead so many astray. And I pray that in Christ I may stand fast, knowing that it is in Him alone that our victory over the world, the flesh and the devil is secure. This I ask in Jesus’ name. Amen. Cindi Ruiz, is an on-fire, Spirit-filled woman of God. She is a blogger from the state of California in the USA and her blog is uniquely named ramblingsofazealot.wordpress.com. 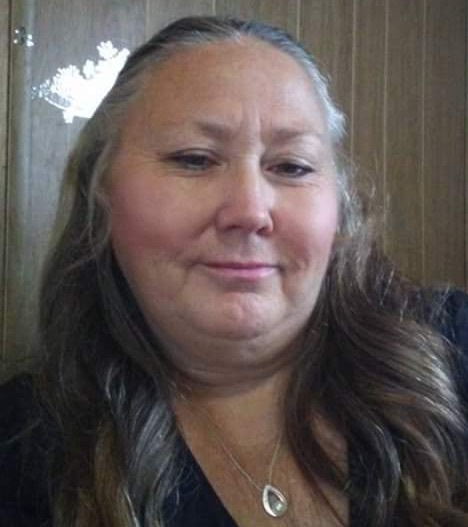 Cindi overcame severe adversity in her personal life and a 40-year drug addiction by the grace and power of the Almighty. She worked previously as a Counselor Intern in the Chemical Dependency/Substance Abuse field with Dual Diagnosis clients. Today, she is devoting all of her time to pursuing the call of the ministry. The original version of this article can be seen on her blog. This edited version is posted here with permission. What a blessing! I am lifted. Sift me Oh Lord, Let thy will be done in my life. Thank You Ma for sharing this blessing today. this is really interesting and educative though, very elaborate. thank you my able lecturer. THANKS FOR THIS SPIRITUAL INSPIRING WRITE UP. I say "Amen" on Cindi's behalf. Let's be sifted so that we can get shifted and we can all be lifted. Amen I love this great piece of reflection. please keep the work going and don't give up posting.kudos ma. let the grace of God abound. Hmmmm sift to shift I like the sound and meaning and i learnt a lot from this. The beginning of this piece just captivates the mind of the reader to find out what is actually being sifted. Thank God for Cindi! She conveyed an important message here and she did it with the best of words. Thank u ma for dis wonderful article.... Am really inspired. Sift me Lord for me to be shifted and lifted!! Amen. And I encourage ourselves to keep cultivating in the lords Vineyard. Nice coinage there! Thank God for Sister Cindi! Nice one Ma. I pray God sifts me and lifts me, he should mold me into the woman he desires.